Nick Elson and I (Julian Stoddart) completed this traverse on August 29th, with no knowledge of Wayne and Jen having been there the day before attempting the same thing (though we did see some signs of recent travel along the way that had us wondering). We left the truck at 4:45 in the morning and traversed to the south ridge of Labour Day Horn as per Don Searl’s report from 2006. Kept the rope in the bag with a few moves of 5th here and there until the descent from Slesse’s Third Peak. Made a few raps down to the 3rd/South Peak notch, from near the plane wreckage site. Ascending and Descending the South Peak was our crux. We were likely “off route” on ascent and ended up simul climbing some mid 5th on quite bad rock, In retrospect we’d have been better off staying closer to the crest where the rock was cleaner (we were slightly West). A few raps from the south peak (again would have been better to stay right on the crest) brought us to the base of the main summit. 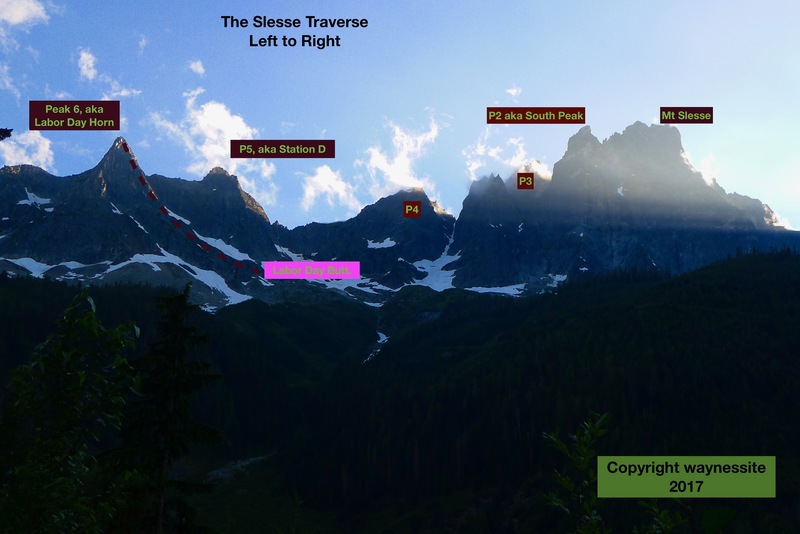 A quick traverse had us on the regular descent route, which we climbed quickly to tag Slesse proper, passing Kevin McLane and partner who were descending from the NEB. Me : Not sure if this effort is the first ascent? Who cares much anyways, Cheers to them!! So fast!! Short version: Amazing lady helps old climber mans dream come true. 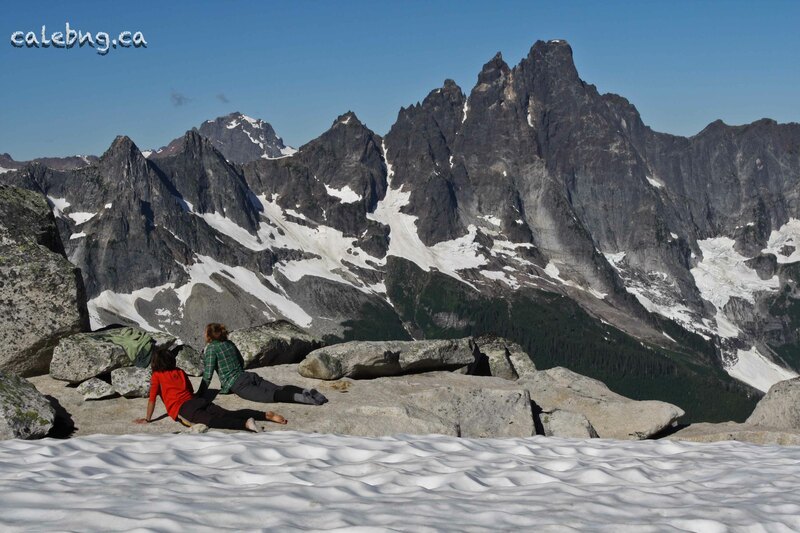 We set off over a 3 day weekend to climb/traverse 5 of the 6 major peaks in the Slesse Range of Southern B.C Canada. -August 27 Rappel “Peak 6” ascend “Peak 5, aka Station D”, 180m 5.7. Rappel, then climb “Peak 4”, South Ridge , low 5th. Difficult rappels off “4”, then ascend “Peak 3”, aka “Southeast Peak 7,100” , 100m 5.7+. The site of the 1956 air disaster. Difficult rappels off “3”, then bypass “Peak 2, aka South Peak” on the west face, then Climb SW Face Mt Slesse 200m, 5.6, Bivouac on Summit. -August 28, Rappel Slesse, continue to Crossover descent back to car. Long Version: I first saw it coming down from Nesakwatch spire weeks before, Why hadn’t someone done the Selesse Traverse?? I was to find out it was a rather brutal and long affair, complete with moss, loose rock and more black lichen than you can fit in your eyes. It was also a very fun and rewarding outing as you make your way across a spectacular ridge line that culminates in the mighty Mt Slesse itself. Peak 5 put up a good fight on the face just right of its south ridge (4p, 5.7). There was a particularly memorable hand crack. Several raps and a long hike to get over to peak 4. It was the least fun summit, and the way down the other side was terrifying. Think sketchy rapps on large loose blocks, chockstones and the like. Even with the first set of trauma raps behind us, the traverse gets more intense as you go.Peak 3 had difficult route finding and a summit that can hardly be touched. It quickly becomes obvious that this is where the airline crash took place. This awful site was eerie, especially when we were again struggling to find good anchors to head down on. On a memorable hanging station made of a single sling, I had to remove a toothpaste tube from the crack behind to rig that single sling. No back-up, and I am not proud of that, though it was bomber. Walking and rapping by huge chunks of metal was one thing, but there were shoes underwear, seatbelts and other personal effects. I can tell you the airplane was yellow, and it was so close to clearing the saddle, that it blew debris over to the other side of the mountain. We were very happy to make it to the saddle before the peak 2 Aka: South Peak of Slesse), but we were so very tired from the 2 long days and concerned for our committed position of having to get to the top of Slesse itself for retreat. It was after a long soul search that we elected to go around p2 for expediency as it would have taken many more hours to get up and down that one. As it was, we got to the top of Slesse an hour before dark. We relished our new camp and its relative safety on this incredible mountaintop. All that was left to do was again rappel and down climb forever, then get over the long, long, long Crossover descent and get back to the truck the next day. Special thanks to Bree and Russ for the use of the truck, Jenn for being a trusting and loving soul, and Drew for setting the history straight. So this amazing project appears to still be up for grabs. Will future aspirants overcome the dangers and difficulties in fine style? I sure hope so. I can’t wait to read the report! Jenn on Labor Day Route. Run!